I know Father’s Day is on the calendar every year and I have exactly 1 year of planning time between each celebration. But, I always remember last minute I need to get my hubby a gift. Actually, hubby and I do not exchange gifts with each other on Father’s Day or Mother’s Day. The gifts come from the kids. He store buys my gifts in a mad panic the night before Mother’s Day, and I hand create something magical in less than 5 minutes the morning of Father’s Day. It’s really the thought that counts right? 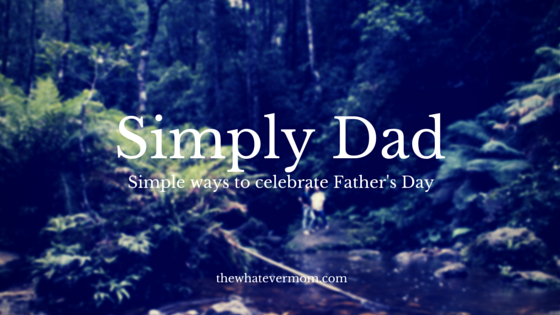 This will be our fifth year celebrating Father’s Day and I thought I’d share a some of our low cost gift ideas and traditions. A Picture Says It All. For my husbands first Father’s day I did my planning in advance (by two weeks). He gave up his Camaro when he found out I was pregnant with twins. So, I converted an empty formula can into a Daddy’s Camaro Fund jar. I used pretty paper to wrap the can, glued on a picture of his beloved Camaro and used foam letter stickers to spell out “Daddy’s Camaro Fund.” I paired it with a custom t-shirt. I took a picture of our twins holding a plastic set of keys. I had the picture screened onto a shirt and above the picture I had printed, “Our tiny hands hold the keys to daddy’s heart.” I spent less than $20 and hubby wears that t-shirt every single year. Print out a cute picture of your kids holding letters that spell out D-A-D and put in a cute frame for his desk at work. Go On A Picnic. We live in an amazingly scenic valley. We walk the same walkway trail every year and stop for a picnic. Hubby wears his t-shirt and I pack a lunch for everyone. It doesn’t matter where we eat. It is just a lovely way to spend the day outside and enjoy some time together. Take your dad to a favorite hiking spot, a park or outdoor area and treat him to a homemade meal. Make Dad The King. After we take our usual walk we return home so hubby can sit in his favorite comfy outside chair with an icy cold beer. My husband works a lot of hours so we can afford for me to stay home (and write this killer blog). It’s only fitting to let him relax while we do a little work. The girls and I wash his car. It isn’t always a perfect car wash with two littles helping out, but it is a nice way to let him enjoy some down time and I can teach my kids how to do something nice for someone else. Kiddie Coupons. One year I was so behind in my planning that I grabbed blank, white printer paper and hand drew some cute coupons from the kids. Of course the girls helped me with the silly ideas. We made coupons for free snuggles, free date days and free car washes. Hand make some fun little coupons to let dad know you appreciate his hard work, or find a great Pinterest site with kiddie coupons and print them out! Overall, we don’t make a big fuss about Father’s Day. My kids are still so little that it is really more about laying the foundation for showing gratitude and expressing appreciation. One day the girls will be in charge of the gift planning and I hope they understand it isn’t the amount of money that goes into a gift, rather the amount of thought that goes into it. What are some of your favorite Father’s Day gift ideas? Please share away! « I Said I’d Never Do —>THIS! I’m sure he’ll appreciate showing off the family! I know my hubby likes to share pics with his co-workers too. I love these tips. I must admit I am still not sure what to get my hubby for fathers day, from the kids, and I may just use your idea for the “car fund”. Even the make him king for a day one would be fabulous! I love the fund jar idea! I truly believe that Father’s/Mother’s Day is from the kids, so I let my daughter pick out whatever she wants for her dad. She’s only three, so the gifts may be a little silly, but my husband gets a good laugh out of it anyway. It definitely makes the holiday more fun! It’s fun to see what things kids consider a gift. 😉 But, it’s chosen with so much love! The ideas in this post are great! It just goes to show that it truly is the thought that counts. I love that y’all don’t purchase gifts, but that you out thought into something simple. Those are the best I gifts, better than anything advertised for these holidays in the store! The kids really enjoy making things and having their parents get excited about it! Yes it’s really the thought that counts and showing appreciate to a beloved dad. I always wait until the last minute too! My husband has been wanting copper mugs for Moscow Mules forever. I finally remembered to order some! He’s going to be so surprised! Now I need to figure out something for my dad. Thanks for sharing this great list! I am taking my husband on a picnic with our daughter for Father’s Day! Soooo much fun and it shows that you really put some thought into the day! So many great ideas! Pictures are always my favorite to give as a gift…but I love your idea of going on a picnic! We might just have to do that this year! I love those ideas! Hello fellow twin momma! I love those ideas! Hello fellow twin momma! Kiddie coupons is a great idea!